In response to overwhelming and continued demand, the fellowship and scholarship programme has been extended for another three years from 2016 to 2019, and expanded to provide 300 fellowships and 10 scholarships. 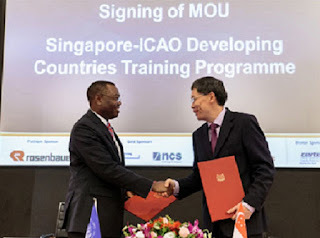 Singapore and ICAO jointly established a Developing Countries Training Programme (DCTP) in 2001 which is sponsored by the Singapore Government and administered by the ICAO Technical Cooperation Bureau for specialised training programmes conducted by the Singapore Aviation Academy (SAA). The Singapore Aviation Academy works closely with the Singapore Government and international funding agencies to secure training fellowships for developing countries. The fellowships/scholarships are intended for participants nominated by their respective Governments. Nominating Governments should preferably nominate not more than 2 candidates for each course and advise which candidate should take priority if more than one candidate is nominated. The Government of Singapore will bear the training fees, daily allowance of Sixty Singapore Dollars (S$60) and hotel accommodation for participants accepted for the programmes. Complimentary breakfast will be provided at the hotel and lunch at SAA during training days. Travel arrangements are to be made and costs borne by the nominating Governments. Hotel accommodation will be provided for the training duration, i.e. one day before course commencement (after 2 pm) and one day after the course (till 12 noon). Daily allowance will be limited to the training duration, i.e. from the start of the course up to the last day of the course. Expenses to be incurred for stay beyond this duration will not be covered. Travel arrangements are to be made and costs borne by the nominating Governments. Before proceeding with online application, Nominating Governments should complete and endorse the Nomination Form available here as part of the application process. The PDF copy of the completed Nomination Form needs to be submitted as part of the on-line application. All applications should be submitted on-line by the stated closing dates.